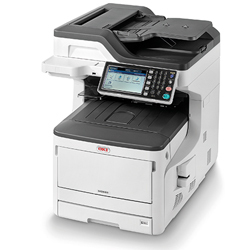 The Oki MC853dnv is perfect for workgroups that would like to print in colour and streamline their copy, fax, and scanning jobs in one all-rounder. It is an LED multifunction printer that promises lower running costs and solutions like a standard duplexer, direct printing from or scanning to a USB stick, and a touch-screen LCD panel to increase productivity in the workplace. However, the budget-conscious may be turned off by the high initial price, while the large and bulky build could take up a lot of space in a small office. It weighs 89.3Kg and measures 1216mm tall, 600mm deep, and 563mm wide, so it tends to take up a lot of space. The bulky and imposing frame is offset by the attractive seven-inch backlit LCD touch screen panel with one-touch operational buttons on the side for easy on-board configuration. The Oki MC853dnv has a 33.6Kbps fax modem, a digital copier, and a flatbed scanner with a 100-sheet reversing automatic document feeder. Paper feeds mainly from a 300-sheet cassette, while a 100-sheet multi-purpose tray handles specialty media. The default connections are Ethernet, two host ports, and USB 2.0. Colour printing enables the production of bright and more attractive documents and images, in speeds of up to 13ppm in A3 or 23ppm in A4. Double-sided printing is automatic and can help reduce paper consumption. Important documents can be stored in the on-board 250GB hard disk drive of the Oki MC853dnv for later access. Images can be scanned directly to a flash drive or sent to a PC over a network. Up to 25 users can share the Oki MC853dnv. One-touch scan, copy, print, and fax buttons simplify the use of this printer. The Oki MC853dnv is a large and heavy machine. Users are better off with an actual fax machine due to the limited functions of the one that comes with this device. It can be expensive to upgrade the Oki MC853dnv with additional paper trays and finishing options.